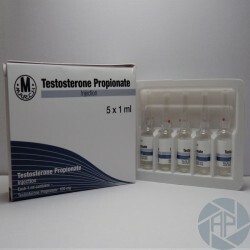 Testosterone propionate - is one of the well-known testosterone esters. Many athletes often asked: what is the real difference between the two; it seems at first glance, the same substance? The differences lie in the extent of occurrence and duration of action of the drug in the body. Testosterone due to its characteristics is considered active steroid that is released from the human body within a maximum of 3 to 4 days. Upon receipt of the cartridge, which remains in the blood for 24 hours. But it should not be assumed that these properties influence the effectiveness of the drug. No, not at all. Even on the other hand, is considered an advantage for athletes, since this provision of the drug leads to following minor side effects. In comparison with other esters and the faster effects of testosterone propionate, testosterone analogues. However, this difference is not very big, so many athletes just feel the difference in the speed of their actions. The average rate of taking this medication has a duration of approximately 4 weeks. Some athletes take it, and 5 weeks in a row. As a general rule, it is experienced bodybuilders who are not involved in the first year of taking anabolic steroids, and understand the characteristics of your reception. Otherwise the same, and there are also athletes who take medication for a shorter period - around 3 weeks. Generally, beginners, or those athletes that actively fear of side effects. A few words should be mentioned about taking the drug in the combined courses. Many athletes take in combination with many other anabolics. In his opinion, this combination allows us to achieve better results with less risk of side effects. It fits perfectly with the drug, especially with many other testosterone esters. The course after course of therapy to use Nolvadex. The initial dose of the drug is considered to 50 mg per day. Why start? Since there are athletes who take the initial dose twice - approximately 100 mg per day. It all depends on the State of the body of the host, its experience, and its resistance. The most common side effects of the bodybuilder's words are acne, Gynecomastia, hair loss, prostate enlargement. As a general rule such side effects occur as a result of a significant drug overdose. Such side effects are typical of all testosterone esters. It is due to the specificity of action on some of the functions of an athlete. So make sure that at the end of the course of the preparation needed to proceed to the stage of a course of therapy. Besides, women taking the development may also occur masculinization. As any other drug by testosterone, he converted quickly and scented to estrogen in humans. It is also due to its side effects. The analysis of the responses of athletes of all categories can be concluded that the drug has a good anabolic property, can significantly increase the muscle mass of the athlete, leads to its quality. The creators of the drug were released good biochemical properties. Therefore, you can change in a positive direction of the nitrogen in the body balance, increases the level of insulin-like growth factor not only muscle but also in the liver, so it facilitates the work rate greatly during the administration of other anabolic steroids. It also restores a strong athlete. It takes place through satellite cell proliferation in muscle tissue, in consequence of which it is not hyperplasia, which leads to the normalization and the restoration of the muscles of athletes.